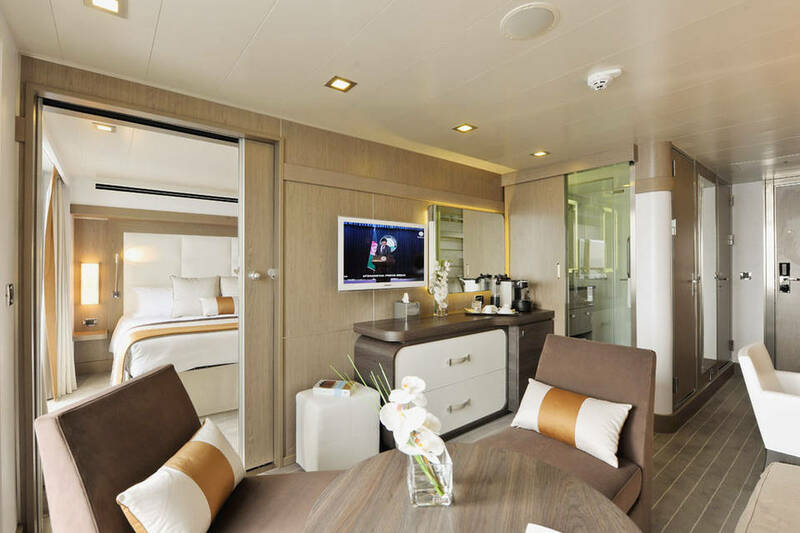 You can expect magnificent ocean views as 124 staterooms and suites have balconies. Choose from two restaurants for breakfasts, lunch and dinner. The Gastronomic Restaurant is situated on Le Liberté Deck and serves you French and international cuisine accompagnied by fine wine. On the Grill Restaurant, you have the opportuniny to eat outside and enjoy buffet lunch and themed dinner. Fitted with the latest equipment (Kinesis Wall, running machine) and in partnership with the famous Sothys™ brand, the Beauty Centre on L'Austral welcomes you for some unforgettable moments of relaxation and pampering (beauty treatments, hairdresser). PONANT invites you to follow the steps of trappers and of the indigenous peoples of Alaska, during a 15-day expedition voyage aboard L’Austral. From Nome to Vancouver, discover a remote ......click here to read more. Join New York Times science writers Henry Fountain and James Gorman on this expedition to the heart of the Antarctic Peninsula. Witness with them the grandeur of this most remote ......click here to read more. Set sail aboard L'Austral for a memorable 14-day expedition cruise to the discovery of Baffin Bay. You will embark in Kangerlussuaq for an unforgettable journey in the heart of the ......click here to read more. Set sail aboard L’Austral to circumnavigate Baffin Island and discover the fascinating lands of the Canadian High Arctic. With PONANT, enjoy an unforgettable experience on this all new 15-day expedition ......click here to read more. Cross the mythical line of the Antarctic Circle during this 17-day polar expedition cruise to the far reaches of the Southern Hemisphere. After boarding your ship in Ushuaia, you will ......click here to read more. Sailing between Spain, Cape Verde and Portugal, PONANT offers you an itinerary at the crossroads of cultures and traditions. You will set sail aboard L’Austral for an 11-day cruise leaving ......click here to read more. From Portsmouth to Dublin, PONANT invites you to discover an itinerary in the heart of the Celtic Sea. Step aboard the L’Austral for an 8-day cruise to lands of legend ......click here to read more. Spend an unforgettable festive season on a 17-day cruise to the Antarctic. An exceptional polar expedition cruise to discover the most beautiful sites of these southern lands. You will set ......click here to read more. Discover a condensed overview of Central America’s architectural gems and most stunning natural treasures through an exceptional itinerary. In Puerto Vallarta, you will board the L’Austral for a 13-day cruise ......click here to read more. Follow the trail of the polar bear during an Expedition Cruise in the Arctic. Set sail aboard L’Austral for a memorable 13-day cruise around Spitsbergen, one of the jewels of ......click here to read more. This PONANT itinerary is your chance to embark on an 8-day expedition cruise to Greenland. In Kangerlussuaq, aboard L’Austral, you will embark for an unforgettable journey in the heart of ......click here to read more. Sailing between two continents, PONANT offers you an itinerary rich in contrasts and cultural blending, to discover UNESCO World Heritage treasures. Aboard L’Austral, you will travel from Brazil to Senegal ......click here to read more. PONANT invites you to experience something exceptional by discovering the Far North and the immense open spaces of the polar Arctic and its ice floes that extend to the North ......click here to read more. PONANT invites you on an exceptional circuit between Canada, the United States and Mexico. During this 13-day cruise aboard L’Austral, you will notably have the opportunity to discover the mythical ......click here to read more. We invite you on an all-new expedition cruise from the North Atlantic to the Norwegian Sea. Set sail aboard L’Austral for a 12-day circuit and allow yourself to be captivated ......click here to read more. Board L&rsquo;Austral for an all new expedition cruise that will take you from Dublin to Longyearbyen. During this exceptional 12-day trip, you will discover the most beautiful of the Scottish ......click here to read more. In partnership with Ducasse Conseil and Château Latour. From Lisbon to Lorient, PONANT invites you to join an exceptional gastronomic and oenological cruise in partnership with Ducasse Conseil and Château ......click here to read more. Set sail on an all-new itinerary discovering the unexplored shores of the eastern coast of Greenland. During this 15-day expedition cruise, you will follow in the footsteps of the great ......click here to read more. Winding channels, snow-covered mountains, majestic glaciers and narrow passages: welcome to the magic of the Chilean fjords. PONANT is inviting you aboard L’Austral for an 11-day expedition cruise to the ......click here to read more. From Portsmouth to Dublin, we invite you to discover an itinerary in the heart of the Celtic Sea. Step aboard the L’Austral for an 8-day cruise to lands of legend ......click here to read more. Follow the steps of trappers and gold miners in Alaska, during a 15-day expedition voyage aboard L’Austral. From Nome to Vancouver, discover a remote territory still unknown and wild, landscape ......click here to read more. PONANT invites you on a polar expedition cruise to the heart of the icy realm that is the Antarctic Peninsula, to pay tribute to the famous Belgian explorer Adrien de ......click here to read more. Jean-Baptiste Charcot, Adrien de Gerlache, Ernest Shackleton: sail in the wake of these great Antarctic explorers during a 16-day polar expedition cruise. Your trip will begin in Ushuaia, the Argentinian ......click here to read more. With Lorient as the departure point, set sail aboard L’Austral for an exceptional cruise along the coast of Brittany. The Ponant Islands, the common theme of this brand-new cruise, are ......click here to read more. Embark aboard L’Austral for a 23-day luxury expedition from Kangerlussuaq to Nome. We are inviting you to set sail for the Far North, well beyond the Arctic Circle, to a ......click here to read more. In partnership with Cuisine et Vins de France. Through an exceptional itinerary, we invite you to discover an unspoiled America where the past seems to have left a still intact, ......click here to read more. Set off to discover the treasures of the Celtic Sea. This 8-day cruise will take you into the heart of landscapes of wild and melancholic beauty: between lush green prairies, ......click here to read more. Travel to the heart of Ultima Thule, a legendary stopover for those in love with the polar regions. Step aboard the L’Austral in Kangerlussuaq for a 17-day expedition cruise to ......click here to read more.